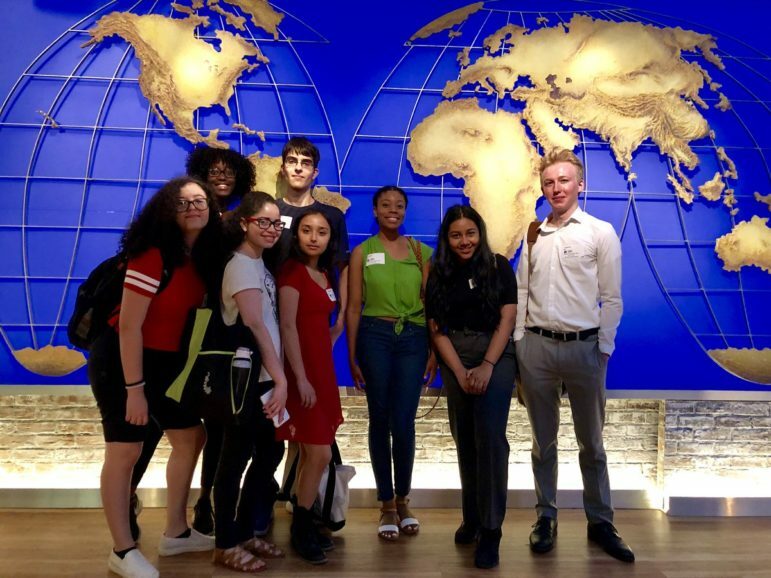 CLARIFY's summer 2018 interns during a field trip to CBS News, seen here in front of Walter Cronkite's famed map. on issues affecting their own neighborhoods. City Limits also hosts individual interns receiving course credit for their work with us. Questions about City Limits’ internships? Email us. Click here to learn more about how to support the program. Most teenagers cannot attend summer classes, jobs or internships unless they’re supplied with a MetroCard or are able to pay for one themselves. After years waiting for a bridge to connect splintered sections of the Bronx park, the city is still short on funds to make it happen. New parking restrictions on Roosevelt Avenue are hurting Queens businesses, making it harder for customers to park, workers say. “They come in, they buy coffee, and they get a ticket,” one local shop worker said. Elected officials and criminal justice advocates are calling for the city and Mayor Bill de Blasio to shut down the five-story Vernon C. Bain Correctional Center in the Bronx. ‘In a city the size of New York, with its many religious structures, the Commission must be very selective in choosing examples of this building type for designation as individual landmarks,’ the LPC says. Some New Yorkers are indifferent about the upcoming election this fall, saying they either don’t know who the candidates are or don’t follow local politics enough to care. A special election on April 24 will determine who fills New York’s 11 vacant legislative seats, including two in the Bronx: one in the 32nd State Senate District and the other in the Assembly District 80. Tell us everything you can about the story. Upload any documents you want to share here. How can we contact you? This will never be published or disclosed. Council candidate Mel Wymore meets with summer 2017 interns. Members of the City Limits youth program team up with College Now student journalists at Lehman College to quiz Sen. Ruben Diaz, Sr., a Council candidate. Members of the Summer 2017 program interview Councilwoman Helen Rosenthal.